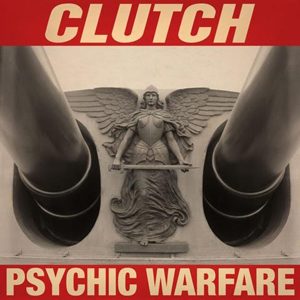 CLUTCH Premieres New Video "X-Ray Visions"
CLUTCH has premiered the new video for the track “X-Ray Visions”, which is featured on the band's forthcoming new album, Psychic Warfare. The video was shot by renowned photographer Dan Winters. In addition, Sirius XM’s Liquid Metal (Sirius XM channel 40) will be premiering the audio track of “X-Ray Visions” throughout their programming from July 29th to July 31st. Check out the video for “X-Ray Visions” on KNAC.COM right HERE. 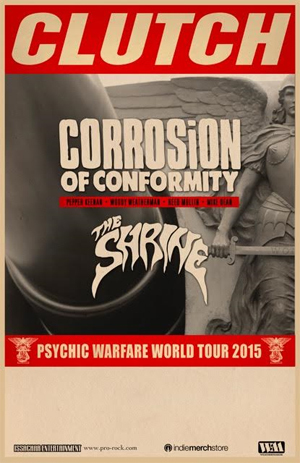 CLUTCH will be embarking on a fall tour with special guests CORROSION OF CONFORMITY (COC) and THE SHRINE supporting starting on October 3rd in Fort Lauderdale, FL at Revolution. Leading up to the tour, CLUTCH will be doing select festival dates along with a Labor Day weekend show at The Joint in Las Vegas supporting PRIMUS. The band will also be co-headlining with MASTODON on select dates with special guests COC as part of leg 2 of THE MISSING LINK TOUR which features full sets by both CLUTCH and MASTODON. The special CLUTCH fan club concert ticket pre-sale is going on now at this location: http://clutch.missiontix.com/. The new album Psychic Warfare will be available for pre-sale through iTunes, Google Play, and Amazon starting this Friday July 31st. iTunes will have the song “X-Ray Visions” as an instant gratification track to go along with the digital pre-sale. CLUTCH will be releasing its eleventh studio album October 2nd via their own label Weathermaker Music. The album was produced by longtime producer Machine and consists of 12 new tracks. “The title Psychic Warfare is taken from the track, "X-Ray Visions"” states singer Neil Fallon. “It’s a tale about an unnamed protagonist who is forced to seek refuge in a flop house motel. He is hiding from several nefarious psychic forces, the worst of which is his own sleep deprived paranoia.” The album cover was designed by renowned photographer Dan Winters. "A Quick Death In Texas"
"Our Lady Of Electric Light"